21 Commonwealth is located on the north side of Commonwealth, between Arlington and Berkeley, with 19 Commonwealth to the east and 23 Commonwealth to the west. 21 Commonwealth was built ca. 1868, one of two houses (21-23 Commonwealth) built at the same time and designed to form a symmetrical composition. 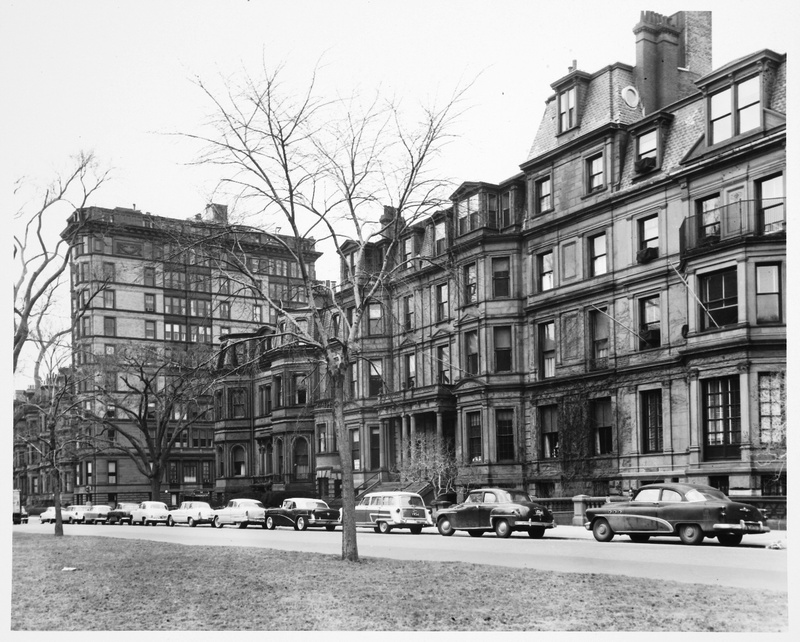 21 Commonwealth was built as the home of John Appleton Burnham and his wife, Jane (Denison) Burnham. 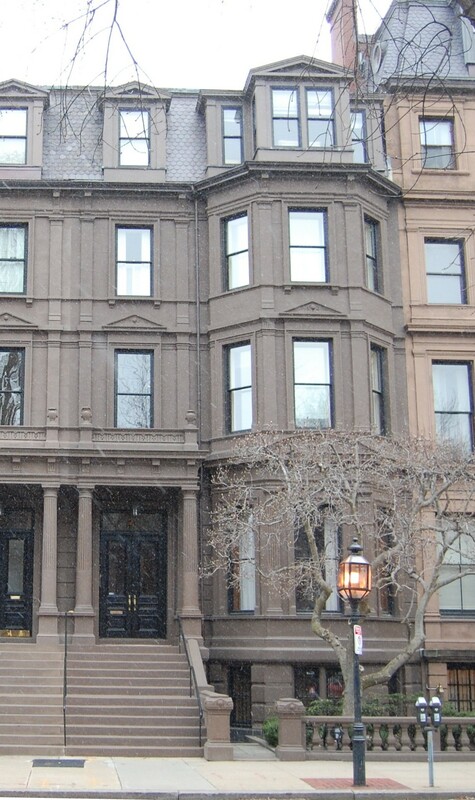 23 Commonwealth was built as the home of Daniel Nicolson Spooner and his wife, Elizabeth (Torrey) Spooner. The land on which 21-23 Commonwealth were built was part of a larger tract of land purchased from the Commonwealth of Massachusetts on May 2, 1860, by shipping merchant and US Congressman Samuel Hooper. The tract extended west from the lot where 11 Commonwealth would be built to the corner of Commonwealth and Berkeley. Samuel Hooper and his wife, Anne (Sturgis) Hooper, built their home on the corner lot, at 27 Commonwealth. On July 2, 1860, Samuel Hooper sold a lot with a 60 foot frontage, where 21-23 Commonwealth would be built, to Gardiner Howland Shaw, and on July 10, 1865, G. Howland Shaw sold it to John C. Gray. John Gray sold the western portion of the lot, with a 20 foot frontage, to Daniel Spooner on January 29, 1867, at which time he indicated that had contracted to sell the land the east to Joseph B. Moors. That sale apparently did not close and on March 29, 1867, he sold the eastern portion, with a 29.5 foot frontage, to John Burnham, and the strip in the middle, with a 10.5 foot frontage, to Daniel Spooner, bringing that lot to 30.5 feet. Click here for an index to the deeds for 21 Commonwealth. John Burnham was agent for various cotton mills and also served as President of the Nashua Iron and Steel Company. 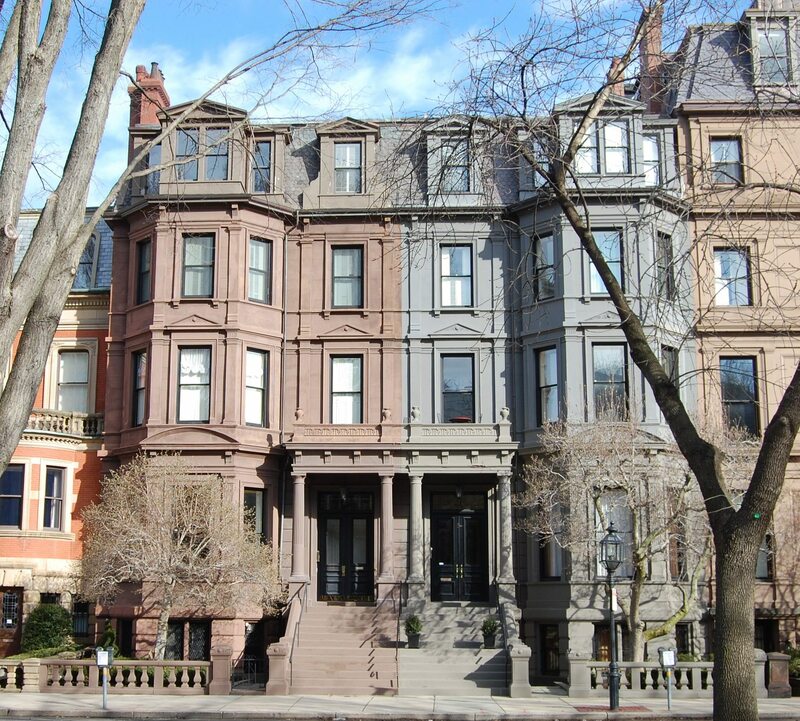 The Burnhams also maintained a home in Brookline, which previously had been their primary residence. John Burnham died in August of 1884. 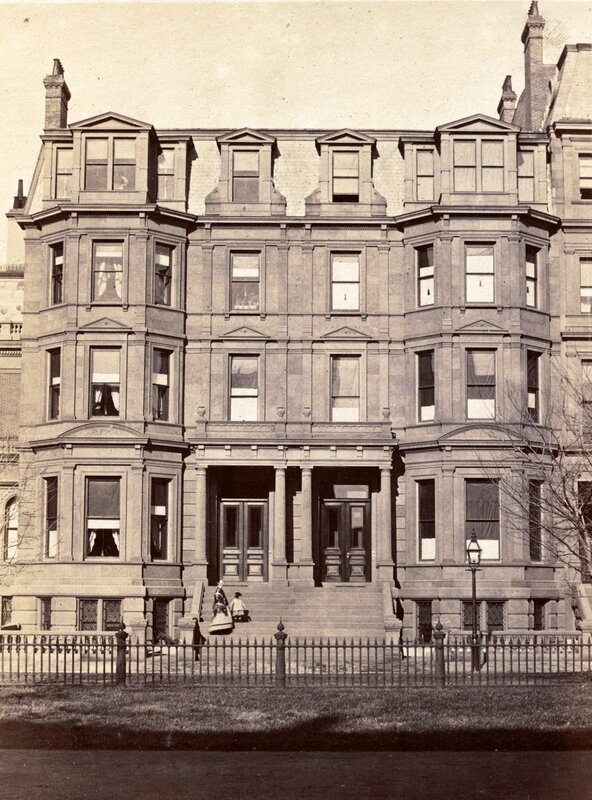 Jane Burnham continued to live at 21 Commonwealth with their unmarried children, Maria D. Burnham and Henry Denison Burnham. Maria Burnham married In April of 1885 to attorney Charles Fry. 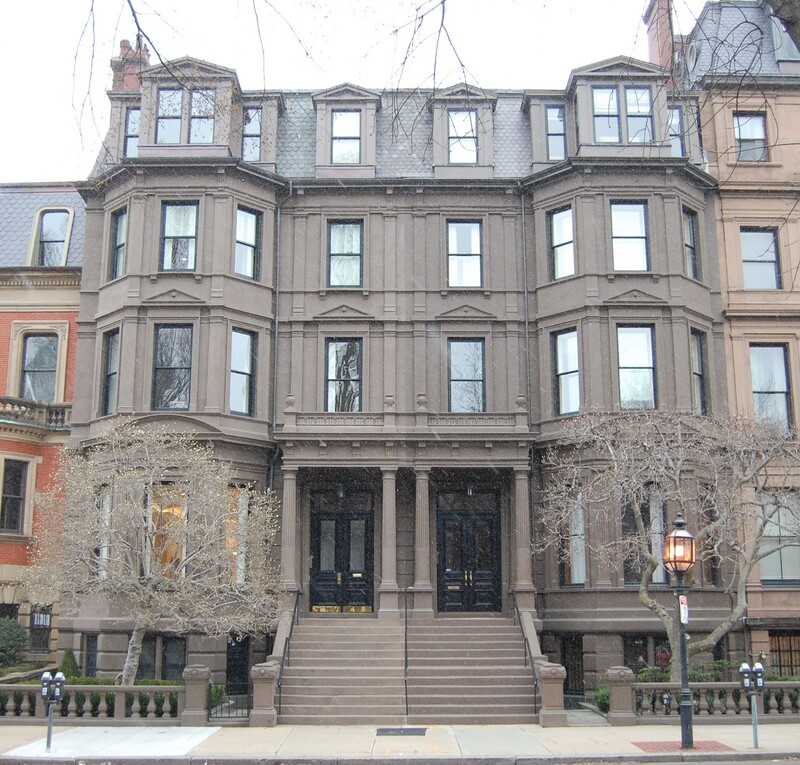 After their marriage, the Frys lived at 21 Commonwealth with Jane Burnham. Henry Burnham married in April of 1888 to Johanna Barbara Heckscher, and they moved to 293 Beacon. Jane Burnham died in March of 1899. After her death, the Frys continued to live at 21 Commonwealth. They also maintained a home in Bar Harbor. The house was not listed in the 1901 and 1902 Blue Books, and in 1902 the Frys were living temporarily at 253 Marlborough. On July 2, 1902, the estate of John Burnham transferred 21 Commonwealth to Maria Fry’s brothers – John Appleton Burnham, William Appleton Burnham, and Henry Denison Burnham – as trustees under John A. Burnham’s will for her benefit. By the 1902-1903 winter season, the Frys were living at 21 Commonwealth again. Maria Fry died in February of 1906, and Charles Fry continued to live at 21 Commonwealth until his death in September of 1910. On October 1, 1909, the trustees under John A. Burnham’s will had transferred an undivided one-half interest in 21 Commonwealth to the Frys’ older son, John Fry, who lived in Eden, Maine. On January 7, 1911, they transferred the other one-half interest to their younger son, Charles Fry, who lived in Philadelphia. And on July 1, 1911, the estate of Maria (Burnham) Fry released its interest in the property to John and Charles Fry. By the 1911-1912 winter season, 21 Commonwealth was the home of William Henry Schofield and his wife, Mary Ward (Lyon) Cheney Schofield. He was a professor of English and head of the Department of Comparative Literature at Harvard. He also taught Old Norse and Norwegian and was a pioneer of Scandinavian studies at Harvard. On June 20, 1913, 21 Commonwealth was acquired from John and Charles Fry by Ralph W. Dunbar, a lawyer, and on July 15, 1913, it was acquired from him by Jane (Eaton) Cotton, the wife of Joseph Hall Cotton. The Schofields continued to live at 21 Commonwealth during the 1913-1914 winter season, after which they moved to Peterborough, New Hampshire. By the 1914-1915 winter season, 21 Commonwealth was the home of Joseph and Jane Cotton. They previously had lived at 18 Exeter. They also maintained a home in Marion. Joseph Cotton was treasurer of the American Tube Company, manufacturers of brass tubing. He died in February of 1919. In June of 1920, Jane Cotton married again, to Guy Murchie, a widower with four children. He was an attorney. In 1898, as a college student, he had organized the Harvard Contingent of the Rough Riders during the Spanish American War and had served under Theodore Roosevelt. Guy and Jane Murchie lived at 21 Commonwealth after their marriage. During the 1923-1924 they were in California and 21 Commonwealth was the home of Joseph Clark Hoppin and his wife, Dorothy Woodville (Rockhill) Hoppin. He was a noted archeologist and historian of Greek classical vases. The Hoppins continued to live there during the 1924-1925 season, and the Murchies lived at the Hotel Princeton at 1277 Commonwealth Avenue. By the 1925-1926 winter season, the Murchies had moved to 25 Chestnut and Jane Murchie had become an antiques dealer, operating Queen Anne Antiques at 739 Boylston. She continued to own 21 Commonwealth. During the 1925-1926 winter season, 21 Commonwealth was the home of banker and broker Quincy Adams Shaw McKean and his wife, Margarett Hunnewell (Sargent) McKean. They had lived at the Hotel Vendôme during the previous season. They also maintained a home in Prides Crossing. In April of 1926, they purchased and subsequently moved to 205 Commonwealth. By the 1926-1927 winter season, 21 Commonwealth was the home of Mabel Florence (Smith) Wolfe Baldrige, the widow of Dudley Wolfe and the estranged wife of Omaha insurance broker Joseph M. Baldrige. Living with her were two of her sons by her first marriage: Dudley Francis Wolfe and Grafton (Wolfe) Smith. In the mid-1920s, Dudley and Grafton Wolfe and Clifford Wolfe, a third son of Dudley and Mabel Wolfe, took the name Smith at the behest of their grandfather, Benjamin Franklin Smith. Dudley soon changed his name back to Wolfe with his grandfather’s consent; Clifford and Grafton remained Smiths. Benjamin Franklin Smith also lived at 21 Commonwealth. He died in March of 1927. By 1928, Mabel Baldrige had moved to 78 Beacon. Dudley Wolfe traveled abroad in 1928 (he spent much of his life traveling in Europe and elsewhere; in 1939, he died while attempting to climb K-2, the world’s second highest mountain). Grafton Smith moved to 9 Lime, and in March of 1928 married to Janice Vaughan; after their marriage, they lived at 90 Chestnut (he died in an automobile accident in September of 1931). On June 23, 1927, 21 Commonwealth was purchased from Jane Murchie by Reginald William Bird, a wholesale dealer in chemicals and roofing materials. He previously had lived at 29 Brimmer, where his wife, Violet Dean (Gooderham) Bird, had died in January of 1927. He also maintained a home at Waveney Farm in Framingham. In June of 1932, he married again, to Elizabeth Frances (Bowditch) Emery, the widow of Manning Emery. They continued to live at 21 Commonwealth until about 1943, but had moved to an apartment at 6 Arlington by 1944. On January 4, 1944, 21 Commonwealth was acquired from Reginald Bird by real estate dealer Ray C. Johnson. On February 29, 1944. 21 Commonwealth was acquired from Ray Johnson by the Stenograph Secretarial School, Inc. In April of 1944, it applied for (and subsequently received) permission to convert the property from a single-family dwelling to classrooms and offices. By 1945, it was known as the Winslow Secretarial School. On October 1, 1956, 21 Commonwealth was acquired by Louis Richmond from the Winslow Secretarial School and from Samuel Rosen, to whom the school’s assets had been assigned for the benefit of its creditors. On December 31, 1957, 21 Commonwealth was acquired by the Arts Foundation of Boston. On January 30, 1958, 21 Commonwealth was acquired from the Arts Foundation of Boston by the Hillcrest Remedial Reading School. 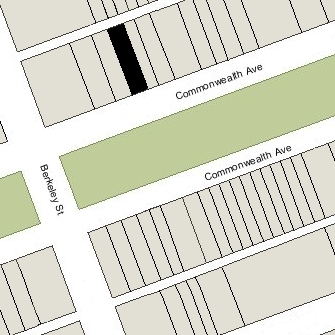 On October 7, 1960, 21 Commonwealth was acquired from the Hillcrest Remedial Reading School by 21 Commonwealth Avenue, Inc. Matthew J. Malloy was treasurer of the corporation and purchased the property on behalf of Chamberlayne School and Chamberlayne Junior College, of which he was the president. In October of 1960, Chamberlayne filed for permission to convert the property from classrooms and offices to a dormitory for 40 students. The application was not granted and the subsequent appeal was withdrawn. On December 30, 1960, 21 Commonwealth Avenue, Inc., transferred the property to Chamberlayne School and Chamberlayne Junior College. In January of 1962, the school filed to confirm that the occupancy remained classrooms and offices. In the fall of 1966, the building suffered what appears to have been a major fire, requiring that Chamberlayne make repairs on all floors and to the roof and mansards. Chamberlayne went bankrupt in the mid-1970s, and on March 31, 1975, 21 Commonwealth was transferred to the Home Owners Federal Savings and Loan Association. On July 30, 1975, 21 Commonwealth was purchased from the bank by Newbury Junior College, which continued to use it for classrooms and offices. On September 24 1984, 21 Commonwealth was purchased from Newbury Junior College by Emerson College. On March 4, 2002, 21 Commonwealth was purchased from Emerson College by Paul J. Ayoub, trustee. In July of 2002, the new owner filed for (and subsequently received) permission to convert the property from classrooms and offices back into a single-family dwelling. 21 Commonwealth remained a single-family dwelling in 2015.